Hunting Buffalo in Florida is among the many popular hunting activities in the state. With Florida Hog Hunts, you’ll experience the finest activity worth your time. But before you hunt, take note of the following details about hunting Buffalo. Buffalo are among the large groups of animals found in different parts of the world. They come in different species like water Buffalo, African Buffalo and American Buffalo. Native Americans hunted the American Buffalo for food. This Buffalo species can reach up to 3 meters long and 2,000 pounds in weight. Due to their enormous sizes, earlier Native Americans would chase after Buffalo and drive them towards a cliff to fall for effective kill. Today, hunting practices have improved to extend the activity to more individuals. It is easy to find other Buffalo hunting sites. Aside from hunting Buffalo in Florida, guests can also go to Montana, Arizona, Texas, Wyoming, New Mexico and many more to hunt for these animals. The activity is legal although state policy differences may result in controlled hunting activity. One reason for permitting hunting is minimizing the Buffalo population to a certain count. Controlling Buffalo’s population decreases the chances of spreading bovine diseases to farm bovine species, which are taken care of for food production. Don’t worry about hunting because it’s permitted. Numerous preparation must be done before going on a hunting trip for these large beasts. First is to look for the best hunting site. Florida Hog Hunts takes pride in having a large privately-owned hunting location that houses numerous animals. After finding the site, prepare your outdoor gear for hunting. Wear comfortable, yet protective clothing. Footwear should also be rugged with light feel for easy movement. Buffalo have keen senses and response quickly once they notice people around or hear other sounds. Be wary of using some rain suits because they tend to be noisy when they touch shrubs or grass while stalking the target. Buffalo have a large build and tough skeletons; guests need to use the right gear for shooting. Rifles are the recommended weapon because of their power and ammunition. However, guest hunters should know the best rifle size to choose according to their targets. A .300 powered rifle is recommended for larger Buffalo while the younger ones can be disabled using a .30 caliber rifle. For some hunting Buffalo in Florida using bows and arrows, guests must be able to exert up to 65 foot pounds of energy for pulling. If you don’t know which weapons to choose, our expert guides will help you choose the best weapon type according to your preference. Being safe while hunting Buffalo in Florida is a vital thing to remember during the activity. Remember that they are large enough to give you a high impact kick. Be sure to stay out of sight if possible. Take multiple shots to their weak spots to ensure a fast and humane kill. 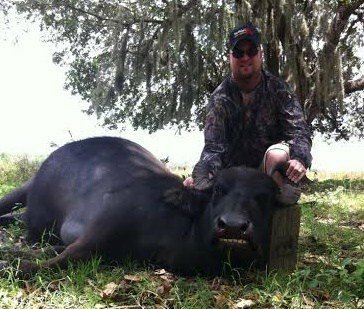 Hunting Buffalo in Florida is a great activity. Experiencing it with us at Florida Hog Hunts Outdoor Adventures will guarantee you’ll get your target while on vacation. Call us at 239-243-9663 for inquiries or booking.